Helix warms up prior to the game against Valhalla on Wednesday. 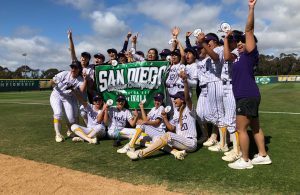 The Vaqueros scored all their runs in the middle innings led by a big fifth inning as they pushed across eight runs to more than double the Monarchs. Early on the Monarchs took advantage and scored two runs in the bottom of the first to take an early 2-0 lead. However, the Vaqueros answered back quickly in the top of the second inning as Taylor North (1-3, 3R, 2 RBI, 2B) doubled in Allyson Von Yokes (1-3, 3R, RBI, 2B) and Katy Hicks (3-4, 2R, 3 RBI) to tie the game. 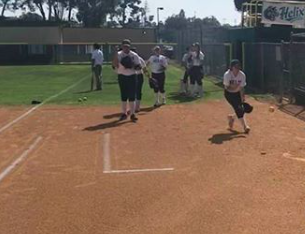 They would take the lead on an error as Madison Michalek-Rosales (3-5, 2R) hit a fly ball that was misplayed allowing North to score, Kiki Angeles (3-4, 3R) would come in to score to make it 4-2 as Monte Vista misplayed another ball. El Capitan added three more runs in the top of the third starting with a sacrifice fly by Kylie Mead which scored Bailey Olaveson (2-4, 2R, 3 RBI, 2B) , Von Yokes advanced to third, Hicks followed with a single to score Hicks which extended the lead to 6-2 and with two outs North scored on another error by the Monarchs. Leading 7-2 in the top of the fourth the Vaqueros added a couple more runs thanks to a single by Olaveson and an RBI single by Hicks to push the score to 9-2. 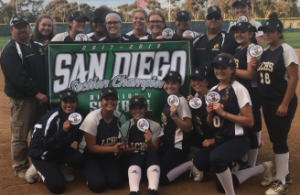 The big innings for El Capitan came in the top of the fifth as Olaveson roped a two run double which scored Angeles and Hannah Davis (2-2, R, 2 RBI), Von Yokes drove in Michalek-Rosales on a sacrifice fly, Mead ripped a double to score Olaveson, Brooklyn Fukushima in to run for Mead, Hicks singled to score Fukushima, she advanced to second on the throw, she would come into score on an error by the catcher and Davis would single to score both North and Angeles to round out the scoring. The Monarchs however in the bottom of the fifth inning didn’t go down easily as they pushed across four runs. For the Vaqueros on the day, Mead would get the victory going all 5 innings while giving up 6 runs on 7 hits while walking 3 and striking out 7. Trailing late the Norsemen managed to snag victory when they were able to push across six runs in the top of the seventh inning to win on the road. The Highlanders would score the game’s first run on an RBI double to make it 1-0. They would add a second run in the bottom of the third inning to take a 2-0 lead. Moving to the top of the fifth still trailing the Norsemen finally got something going as Jade Hill (2-4, 3R, 2 RBI) led off with a walk, Rachel Shelstrom (3-5, 2R) singled to advance Hill to second, Kennedy Labshere (RBI) walked to load the bases and Victoria Villegas (2-4, 4 RBI) tied the game with a hit that scored both Hill and Shelstrom. Valhalla would eventually take a 3-2 lead in the top of the sixth when Labshere grounded out which allowed Hill to score. 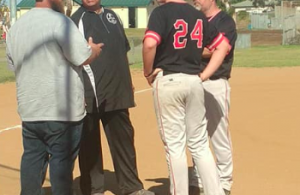 However, the lead didn’t last as the Highlanders scored a run on a Valhalla miscue and they would go on to score a couple more runs to lead 5-3. Valhalla knew they had to do something as they trailed heading into the top of the seventh inning. 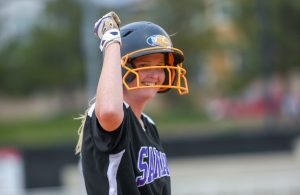 They got off to a good start as Samantha Green singled, she would later score on an Emily Quesada (1-4, R, RBI) base hit. Valhalla would retake the lead on a Jade Hill single to center which scored Lexi Schmehr (1-4, R) and Kelly Olson (RUN). They tacked on a couple more runs on a base hit by Villegas that scored both Quesada and Hill which made it 8-5, Delaney Stettler (1-4, RBI) added the ninth run as she singled to center scoring Shelstrom. Helix would get a run in the bottom of the seventh on a leadoff solo home run before Stettler retired the next three batters to end the game. 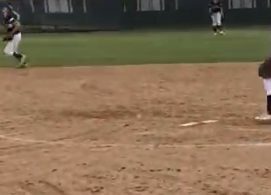 Stettler in the victory for the Norsemen went all 7 innings while giving up 5 runs on 10 hits while walking 1 and striking out 1. With the win, the Norsemen take over sole-possession of first place in the Valley League.